For the architect, see Nicholas Grimshaw. 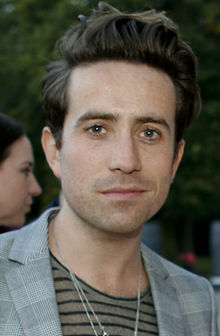 Nicholas Peter Andrew Grimshaw (born 14 August 1984) is an English television and radio presenter. He is best known for having hosted a variety of shows on BBC Radio 1 including his current Drivetime show, and The Radio 1 Breakfast Show between 2012 and 2018. He is also known for his Channel 4 roles in T4 and The Album Chart Show. In 2015, he was a judge on the twelfth series of The X Factor. Grimshaw joined BBC Radio 1 in September 2007, presenting the BBC's youth strand Switch with friend and fellow DJ Annie Mac. He hosted the show for 9 months solo while Mac hosted a weekend lunchtime slot. From October 2008 to May 2009, Grimshaw hosted Radio 1's Weekend Breakfast Show. Grimshaw then went on to present the 10 pm – midnight slot on BBC Radio 1 on 1 June 2009, following the departure of Colin Murray. He regularly joked about how long his position at BBC Radio 1 would last and whether he would actually be able to complete his long list of "1000 Albums Everyone Says You Should Listen To But We Only Have Time To Play One Track So Here It Is" which was a nightly feature on his show. He managed to reach number 369, before he left for the breakfast show. Other features on his show included "Peaceful Ponderings", an interactive minor problem-solving initiative broadcast on the Sunday night show he took part in with Annie Mac; "This Week's Musical Showoff", an interactive new music sharing initiative; "Fresh Off Stage", an interview with an important figure from the world of performing arts; and Rob da Bank's "Monday Night Pop Quiz", between a listener and a musician which culminated in an offensive word being broadcast live on air as the final answer. From 2010–2012, Grimshaw was the main stand-in presenter for Scott Mills on BBC Radio 1. On 11 July 2012 it was announced that Grimshaw would replace the long-standing Chris Moyles as host of The Radio 1 Breakfast Show. The last live show was broadcast on 12 September 2012, although the last show broadcast under the show's name was a pre-recorded episode entitled "The 1000 Albums Show". His first programme was on 24 September 2012. In November 2012, Grimshaw attracted criticism from Magic Radio breakfast presenter Neil Fox for comments he made about Radio 1's decision to omit Robbie Williams's "Candy" from its A-List playlist – reportedly due to being "too old" for the station's target demographic. Some days later, Grimshaw was in the headlines again after it was claimed he refused to promote Rihanna's latest album because she cancelled an interview with him – a claim which Grimshaw denied, noting that his snub was intended to be "tongue in cheek". On 24 October 2013, it was reported that Grimshaw's breakfast show had one million fewer listeners than Moyles' and that its audience figures were the worst for the station in over a decade, with BBC Radio 2, BBC Radio 3 and BBC Radio 4 all beating it in the ratings. At the time, Grimshaw's show was close to the record low of 5.5 million listeners, set by Sara Cox in 2003, toward the end of her three-year tenure hosting the show. In February 2014, the breakfast show recorded an enhancement of more than 700,000 listeners, which set the average number of listeners per week to 6.3 million. However, on 15 March 2014, it was reported that Grimshaw had lost another 510,000 listeners, for a weekly total of 5.78 million. The BBC claimed that this was part of the goal to attract younger listeners, while shedding the over-25s. In March 2014, he completed a twelve-hour bicycle ride for Sport Relief. The event raised more than £115,000. In 2014, he also took part in the Clash of the Titans event as part of John Bishop's team Team Bishop. In May 2015, Grimshaw's Breakfast Show fell to 5.5 million listeners a week, becoming tied with Sara Cox's show for the lowest number of listeners in Radio 1's history. The station controller Ben Cooper congratulated Grimshaw saying, "I'm pleased that Grimmy is doing what I've asked of him by keeping his young audience happy and scaring off the over-30s.". In August 2016, listener figures were reported to have dropped to 5.4 million, down 400,000 year-on-year, and making it the lowest listened to breakfast show in the station's history. In July 2017 the BBC confirmed that Grimshaw's salary was in the £350,000 – £399,999 bracket. In October 2017, Grimshaw's Breakfast Show fell to 4.93 million listeners a week, the lowest listening figures for BBC Radio 1's breakfast show since records began. Controller Ben Cooper defended the stats and said it was still "the most relevant youth brand in the UK today". On 31 May 2018, it was announced that Grimshaw would be leaving the breakfast show and effectively swapping show with Greg James. The move means Grimshaw will take over the 4 pm – 7 pm drivetime slot. Grimshaw hosts a weekday radio show on BBC Radio 1 broadcast Monday to Thursday from 4:00pm until 7:00pm, including a 15-minute break for Newsbeat at 5:45pm. The main focus of the show is music and entertainment in the form of features and celebrity interviews. The show has aired since 3 September 2018. In May 2018 BBC Radio 1 announced 'it's major schedule changes to the station' its 'former' Radio 1 Breakfast Show host Nick Grimshaw and 'former' Drivetime host Greg James would swap shows effective from September 2018. Grimshaw is the third presenter on BBC Radio 1 to have the Drivetime slot. Grimshaw's career started on UK entertainment channel E4, hosting daily shows. In September 2007, he crossed over to Channel 4, hosting the daily breakfast show Freshly Squeezed with Alexa Chung and more recently Jameela Jamil, airing 7 am on weekdays. The pair went on to host various award shows for TV and coverage from music events and festivals for Channel 4. As well as hosting the radio show BBC Switch for BBC Radio 1, Grimshaw and Annie Mac teamed up to host music show Sound for BBC Two. He presented the first ever BBC Switch Awards show with Kimberley Walsh of Girls Aloud on BBC One. In Summer 2011, Grimshaw hosted a live 6-part series for Channel 4 on Saturdays entitled New Look Style the Nation, in which hopeful fashion designers competed for a job at New Look. In 2012, Grimshaw co-presented the iTunes Festival with Annie Mac throughout September for Channel 4. On 30 April 2013, he began presenting BBC Three panel show, Sweat the Small Stuff. On 2 August 2013, Grimshaw hosted a one-off panel show on Channel 4 called That Music Show. In late 2013, Grimshaw appeared in as many soap operas he could, filming cameo roles in EastEnders, Coronation Street, Emmerdale, Hollyoaks and Home and Away. In 2013, he narrated Hotel of Mum and Dad for BBC Three. In 2014, Grimshaw presented The Brits Are Coming, the show that revealed some of the nominees at the 2014 Brit Awards. Since 2014, Grimshaw is a regular guest co–presenter on The One Show. On 16 June 2015, it was revealed that Grimshaw would join the twelfth series of The X Factor as a judge to replace Louis Walsh. He was selected to mentor the "Boys" category and chose Mason Noise, Ché Chesterman and Seann Miley Moore for the live shows. Following the eliminations of Moore in week 2 and Noise in week 4, he guided Chesterman through to the final, where he finished in third place. On 19 February 2016, Grimshaw announced he would not be returning to the show for its thirteenth series and was replaced by Louis Walsh. Grimshaw has expressed his interest for contemporary art and set design. In 2016, he sold one of his paintings as part of a secret charity auction during Frieze Art Fair. He is an ambassador for the Royal Academy of Arts. In 2017, he was commissioned to design a Christmas tree in celebration of the Academy’s 250th anniversary. Interested in live music production, Grimshaw interned with the stage designer Es Devlin in 2017. He also joined a set design course at Central Saint Martins in October 2018. In 2012, Grimshaw had a cameo appearance in the UK release of the Disney film Wreck-It Ralph as Calhoun's deceased fiancé Brad Scott who was killed by Cy-Bugs. This version, however, is not in the UK home release. Grimshaw launched and judged Column Idol 2014, an annual competition set up by charity Media Trust with The Sun newspaper to find new writing talent. He makes a cameo appearance as his own self in Absolutely Fabulous: The Movie (2016). Grimshaw grew up in the town of Oldham, Greater Manchester. He attended the University of Liverpool between 2002 and 2005, studying Communication and Media Studies, but failed his final year, graduating with a DipHE rather than a bachelor's degree. During his studies at the University of Liverpool, Grimshaw was also a member of the University's student radio station, ICON Radio (now LSRadio). On 17 August 2012, Grimshaw came out as gay. He appeared at number 8 on The Independent on Sunday's list of the 101 most influential LGBT people in Britain 2012. Nick Grimshaw was awarded the title of GQ's Best-Dressed Man of the Year in 2014 by the British edition of GQ Magazine. As of October 2018, Nick Grimshaw is in a relationship with dancer and model Meshach Henry . As of 2018, Grimshaw is an ambassador for The Albert Kennedy Trust, a charity helping homeless LGBT youth. ^ "Radio 1 – Nick Grimshaw – 1000 Albums". BBC. 1 January 1970. Archived from the original on 26 February 2014. Retrieved 24 September 2013. ^ Anderson, Steve (30 April 2012). "Nick Grimshaw to replace Chris Moyles as Radio 1 breakfast show host". The Independent. London. Archived from the original on 11 July 2012. Retrieved 11 July 2012. ^ "BBC Radio 1 – Nick Grimshaw, Grimmy's last EVER evening show on BBC Radio 1". BBC. 12 September 2012. Archived from the original on 26 February 2014. Retrieved 24 September 2013. ^ "BBC Radio 1 – Nick Grimshaw, The 1000 Albums Show". BBC. 13 September 2012. Archived from the original on 26 February 2014. Retrieved 24 September 2013. ^ "Neil Fox calls Nick Grimshaw a #totalnob". Radio Today. 6 November 2012. Archived from the original on 11 November 2012. Retrieved 11 November 2012. ^ Anisiobi, J.J. (22 November 2012). "Nick Grimshaw refuses to promote Rihanna album after she snubs interview with him". Daily Mail. Archived from the original on 20 April 2013. Retrieved 24 November 2012. ^ "Nick Grimshaw says Rihanna snub was 'tongue in cheek'". NME. 22 November 2012. Archived from the original on 28 November 2012. Retrieved 3 December 2012. ^ "Nick Grimshaw loses more listeners". bbc.com. BBC. 24 October 2013. Archived from the original on 22 February 2014. Retrieved 18 March 2014. ^ Sweeny, Mark (6 February 2014). "Radio 1's Nick Grimshaw adds more than 700,000 listeners". The Guardian. London. Archived from the original on 10 March 2014. Retrieved 18 March 2014. ^ Dowell, Ben. "What are Nick Grimshaw's audience figures?". Radio Times. London. Archived from the original on 15 May 2014. ^ "Grimshaw hailed for listener losses". Belfast Telegraph. 15 May 2014. Retrieved 8 January 2018. ^ "Sport Relief: Radio 1's Nick Grimshaw completes 12 hour cycle challenge". bbc.co.uk. 17 March 2014. Archived from the original on 18 March 2014. Retrieved 18 March 2014. ^ Longmire, Becca (18 March 2014). "Nick Grimshaw Raises £115,000 For Sport Relief After Completing 12 Hour Bike Ride". entertainmentwise.com. Gigwise. Archived from the original on 31 March 2014. Retrieved 18 March 2014. ^ Plunkett, John. "Radio 1 loses nearly 1m listeners as Nick Grimshaw hits 12-year breakfast low". The Guardian. London. Archived from the original on 29 November 2016. ^ "BBC Radio 1 loses a million listeners as Radio 4 hits new high". BBC News. 4 August 2016. Archived from the original on 4 August 2016. Retrieved 4 August 2016. ^ "BBC salaries reveal who highest paid stars are". ITV News. 19 July 2017. Archived from the original on 19 July 2017. ^ "Nick Grimshaw's Radio 1 show gets worst ever listening figures". BBC News. 26 October 2017. Archived from the original on 26 October 2017. ^ "Nick Grimshaw to quit as host of BBC Radio 1 breakfast show". The Guardian. London. Press Association. 31 May 2018. ^ Claire Hodgson (25 November 2013). "Nick Grimshaw aiming to appear in EastEnders, Emmerdale, Hollyoaks, Coronation Street and Home and Away". The Mirror. Archived from the original on 22 December 2015. Retrieved 13 December 2015. ^ Price, Annie (11 September 2015). "'Where will he pop up next?' Nick Grimshaw's debut on The One Show isn't a hit with fans". Express.co.uk. Retrieved 16 January 2017. ^ "Crystals, Chocolate and Chipboard: Nick Grimshaw on his Royal Academy of Arts Christmas tree | LOVE". LOVE. Retrieved 2018-10-31. ^ "in conversation: es devlin and hannah barry | The Fifth Sense | i-D". The Fifth Sense. Retrieved 2018-10-31. ^ "Nick Grimshaw goes back to university after quitting his Radio 1 Breakfast Show". The Sun. 2018-10-22. Retrieved 2018-10-31. ^ Bourne, Dianne (12 July 2012). "Top of the morning: How Oldham lad Nick Grimshaw landed Radio 1's top job". Manchester Evening News. Archived from the original on 24 June 2016. Retrieved 16 January 2017. ^ Kelly, Emma (12 August 2014). "'My dad will be furious!' Nick Grimshaw discovers he failed degree live on air". Daily Star. London. ^ Petridis, Alexis (17 August 2012). "Can Nick Grimshaw make Radio 1 feel young again?". The Guardian. London. Archived from the original on 30 September 2013. Retrieved 18 August 2012. ^ Roberts, Scott. "Radio 1's Grimmy confirms he's gay and would like to date Frank Ocean". Pink News. London. Archived from the original on 20 August 2012. Retrieved 18 August 2012. ^ "The IoS Pink List 2012". The Independent on Sunday. London. 4 November 2012. Archived from the original on 24 December 2012. Retrieved 27 December 2012. ^ Carvell, Nick. "Style file: Nick Grimshaw". www.gq-magazine.co.uk. Retrieved 2018-10-31. ^ Evans, Mel. "Nick Grimshaw looks loved up with boyfriend Meshach Henry as couple walks hand-in-hand". Metro.co.uk. Retrieved 18 February 2019. ^ "Nick Grimshaw to host this year's AKT Gala Dinner". The Albert Kennedy Trust. Retrieved 2018-10-30. ^ "Adidas to launch 'Prouder' campaign during London Pride to help fight LGBT youth homelessness". Attitude.co.uk. 2018-06-23. Retrieved 2018-10-30. Wikimedia Commons has media related to Nick Grimshaw.